New Delhi: Fruit and vegetable farmers reaped a bumper harvest in 2014 and are set to surpass foodgrain production for the third straight year as deficient rain hit grain output in North India, considered the nation’s bread basket. Horticulture production likely grew to 280.4 million tonnes (mt) in 2014-15 from 277.4 mt the previous year, according to early estimates by the agriculture ministry. Final production figures for 2013-14 as well as initial estimates for 2014-15 are yet to be formally released. In contrast, production of kharif crops, which are sown at the start of the June-September monsoon season, is expected to have declined 7% during the period. Last year’s monsoon had set in more than a month late and had left a nationwide deficit of 12% by the time it retreated. Among the worst affected were Punjab, Haryana and Uttar Pradesh that account for the bulk of the country’s foodgrain production. 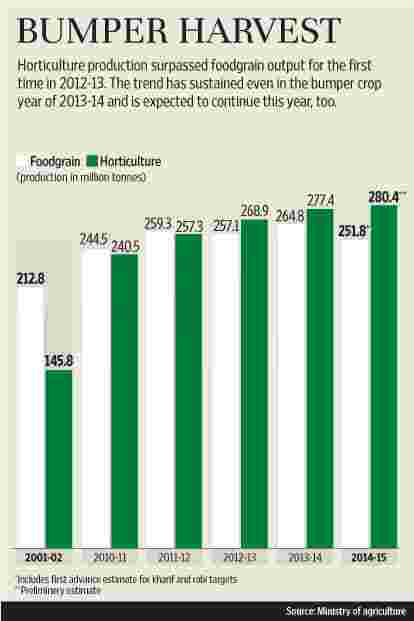 Horticulture production (268.9 mt) surpassed foodgrain output (257 mt) for the first time in 2012-13. The trend has sustained even in the bumper crop year of 2013-14, with horticulture production (277.4 mt) surpassing foodgrain output (265 mt). Current estimates show the trend is likely to continue and that, unlike foodgrain production, horticulture output won’t be hit by poor rain. “Schemes like the National Horticulture Mission have helped in area expansion of horticulture crops, but post-harvest handling operations remain an area of concern," said an agriculture ministry official, who did not want to be named. “Since April last year, the ministry is using satellite data to monitor area under horticulture crops, through the Isro (Indian Space Research Organisation) satellite Chaman. This will help us get more realistic estimates in future." The area under horticulture farming increased from 12.8 million hectares (ha) in 1991-92 to 23.7 million ha during 2012-13, according to data from the ministry of agriculture. Total production during this period increased by almost threefold and productivity increased by 1.5 times. India is now only second to China in the production of fruits and vegetables. Horticulture has helped farmers survive drought years, said D. Narendranath, programme director at PRADAN, a not-for-profit body working on livelihood issues in several Indian states. “Vegetable production has emerged as a life-saver for small and marginal farmers. Returns from vegetable cultivation from small plots are substantially higher than cereal production. As vegetables are shorter-duration crops, the farmer can better play the increasingly erratic rains," he said. Despite the increase in horticulture output, post-harvest losses remain an area of concern. A 2010 study by the Central Institute of Post-Harvest Engineering and Technology, Ludhiana, estimated post-harvest losses of major agricultural commodities including fruits and vegetables at ₹ 44,143 crore per year (at 2009 wholesale prices). The cumulative wastage in fruits and vegetables was estimated at 5.8-18%. A change in consumption patterns with rising demand for vegetables, fruits, meat, milk and eggs in both urban and rural areas has fuelled horticulture and livestock initiatives across the country, Narendranath said. “However, access to markets poses a considerable hurdle for marginal farmers. The way out is aggregating them into producer companies and giving them access to markets, new technology and better practices." During 2013-14, India exported horticulture products worth ₹ 14,365 crore, nearly double the value of exports in 2010-11, according to data from the ministry of agriculture. “Horticulture, fisheries and dairy have immense potential to generate employment. The government is putting in place e-marketing facilities for horticulture crops and has appointed a commission to look into this," agriculture minister Radha Mohan Singh said on Thursday while addressing an agriculture summit.